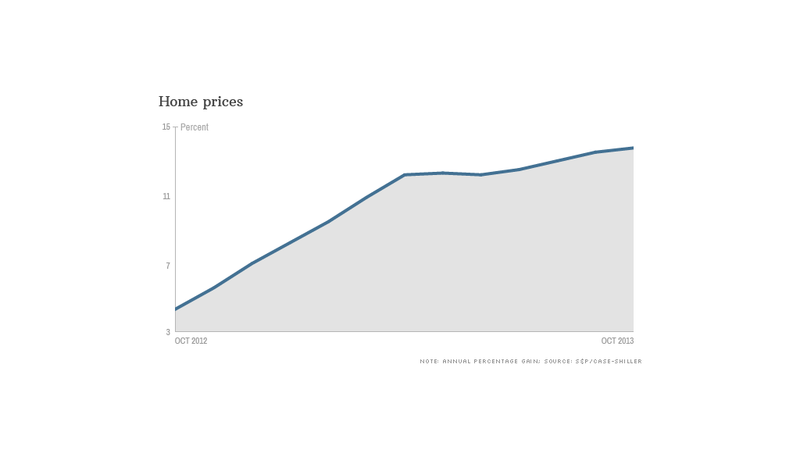 Home prices climbed nearly 14% in the 12 months ending in October. Home prices posted another big annual gain in October, although there are signs that 2013's rapid rise in prices is close to topping out. The closely-followed S&P/Case-Shiller home price index was up 13.6% compared to a year ago, the largest 12-month gain since early 2006, which was the height of the housing bubble. Prices have been improving at a faster annual rate every month for nearly two years. But with the prospect of rising mortgage rates, October prices were little changed from September. "Housing data suggest that we may be close to the peak gains in prices," said David M. Blitzer, chairman of the index committee at S&P Dow Jones Indices. He said prices are expected to rise further in 2014, but the annual gain is expected to be in the single digits rather than the rapid rise recorded for much of this year. The slowdown in price gains is probably good for the market, according to Stan Humphries, chief economist for price tracker Zillow. "Consumers looking at more recent reports should embrace this slowdown, as it will make for a more balanced market in 2014 and beyond," he said. The housing recovery has been a key area of strength in the U.S. economy. Significant drops in unemployment and home foreclosures have combined to drive a rebound in demand for homes. But the fact that many homeowners still can't sell their homes because they owe more on them than they are worth, combined with years of low levels of home building, have left the nation with a tight supply of homes for sale. And that tight supply has helped to drive up prices. Mortgage rates have been rising steadily for months since hitting a record low in the spring. The rate on a 30-year loan is now 4.48%. That has also increased demand as potential buyers look to make a purchase before rates go higher. The gain in prices was widespread, with all 20 major markets tracked by the index posting solid gains. New York, where prices are up 4.9% in the last year, posted the smallest gain, while Las Vegas, which was hard hit by the bursting of the housing bubble, posted the largest gain at 27.1%. Despite the recent rise, the overall index is still about 20% below the record peak reached in July 2006 at the height of the housing bubble.